The Ancient Living kids soap is carefully handcrafted to suit the sensitive skin of your precious little baby. This organic soap is a blend of pure cold pressed oils which will gently cleanse your baby's skin while keeping it soft and supple. It is infused with orange essential oil which is known for its antiseptic and soothing properties. The soap is enriched with vitamin A, C and E which will lather up your baby in its natural and mild goodness. Ancient Living understands a mother's need for the best and safest of things for her child. Ancient Living kids soap fulfills this need by using the best and the safest of ingredients. This soap is made with organic, certified ingredients and comes in the shape of an adorable smiling hippo which will keep your baby smiling while you give them a long soothing bubble bath. About the Brand: Drawing inspiration from Mother Nature, Srinivasa Industrial & Agro Products (P) Ltd under the brand name 'Ancient Living' manufactures pure natural health care, hair care and skin care products based on Aromatherapy and Ayurveda. An energetic and fresh-thinking brand eager to inspire a naturally healthier way of living through their natural products, Ancient Living brings you ancient wisdom in its organic personal care products, native games, artisan products and weaves. With the authenticity of Ayurveda and Aromatherapy wisdom at the brand's core, the brand cares deeply about the wellbeing of all their customers, connecting conscience in everything they do. Explore the entire range of Soaps available on Nykaa. 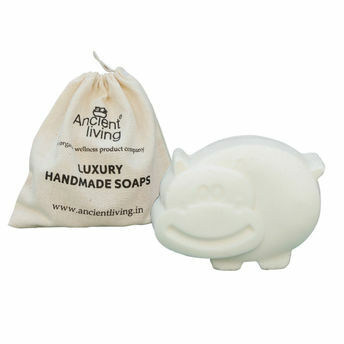 Shop more Ancient Living products here.You can browse through the complete world of Ancient Living Soaps .